Here is another ufo that got finished before 2018 ended. How glorious is that! So .... how did I do for 2018? 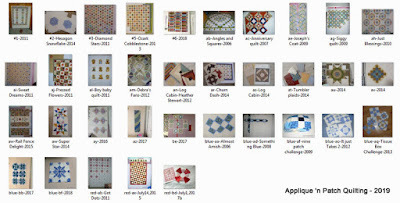 How many quilts got finished. How many ufo's got moved to the tops ready for quilting stage? 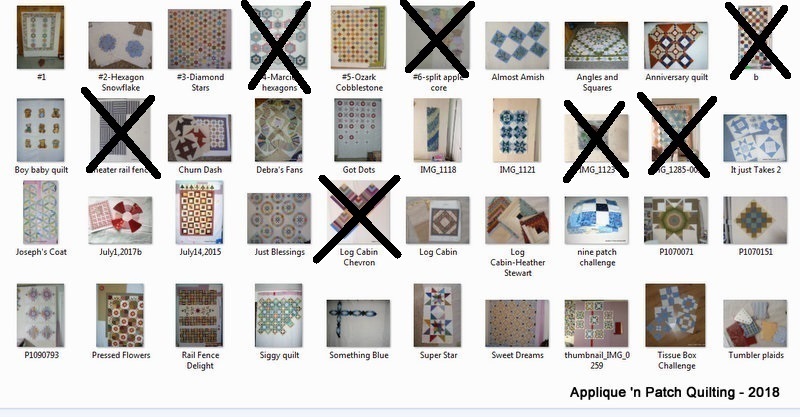 I did a print screen of all my finished tops and my ufos at the beginning of 2018. This is how I keep track of my tops and ufos and new projects. A file was created for each topic and as a item gets finished, the photo gets moved around until it gets a big X. As each one got done on either the ufo file or top file, a big X crosses that photo off the list. The photo below were my tops ready for quilting. There are 23 tops shown below. Eight got crossed off that list during 2018. That is GOOD in my books. Thanks to my LAer, Tella, she helped me achieve this goal and my husband and friends are breathing a bit easier. Everyone is happy to see me sewing binding on a quilt. Heck, I'm happy to do that too. This one below were my ufos and there were 40 here. Seven photos got crossed off during 2018. Really, that is not bad. Seven is better than nothing. Does doing this work for me? Seeing the results, I think it sure does. You have no idea how good it feels to me to make a big X on a photo. Before doing this, a list was made each year, but I'm a visual type of person and seeing a photo helps me more than first realised. What actually is happening is downsizing. I'm starting to see more room on the shelves in my studio. Stuff is not crammed on them like before. Fabric is still being purchased but not in any great quantities anymore. Bins are starting to get emptied. I can't believe I actually wrote that. But, yes, that is happening. What exactly got done for 2018. Here are a few group photos to remind me. So, for 2019, this is what I have. New print screens have been done and I'm ready to do my bit to start crossing off a few tops, ufos and new projects. Yep, bring it on! 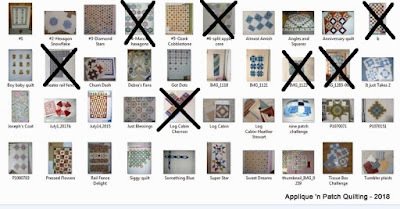 My tops (ready for quilting) has 22 items. Some will be sent out and some will be done by me. 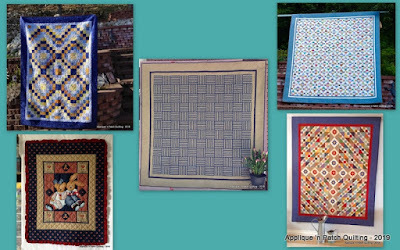 I would like to get a few tops hand quilted. 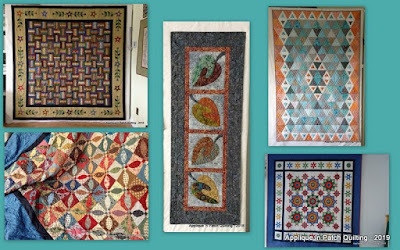 Big stitch hand quilting is calling to me. 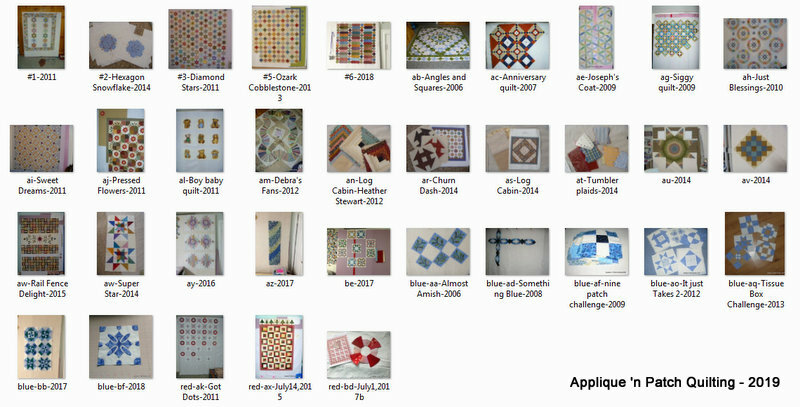 My ufos (or works in progress) have shrunk nicely but a few new projects have been added to the list. My ufos can include any old project but also new projects too. Only 35 now. To sum things up, I'm far happier now than I was a year ago. 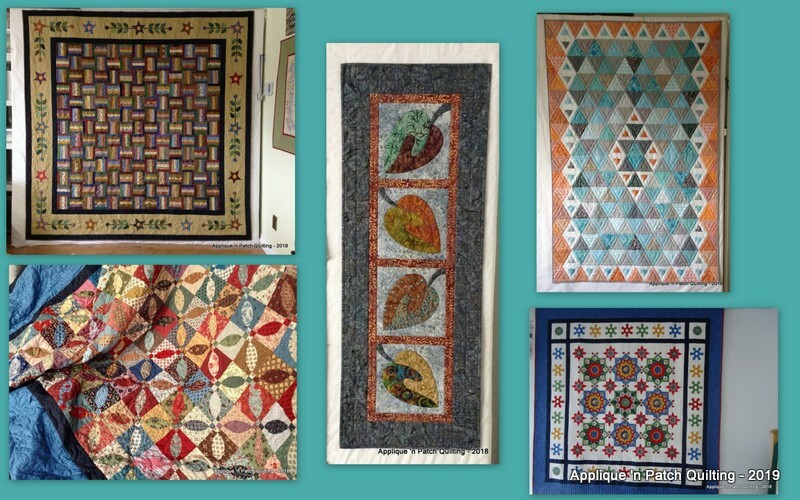 There are a number of quilts that I can pull out at any time for hanging up with the change of each season. Yes, very happy. So, which top will I work on next? The one at the top of this post. 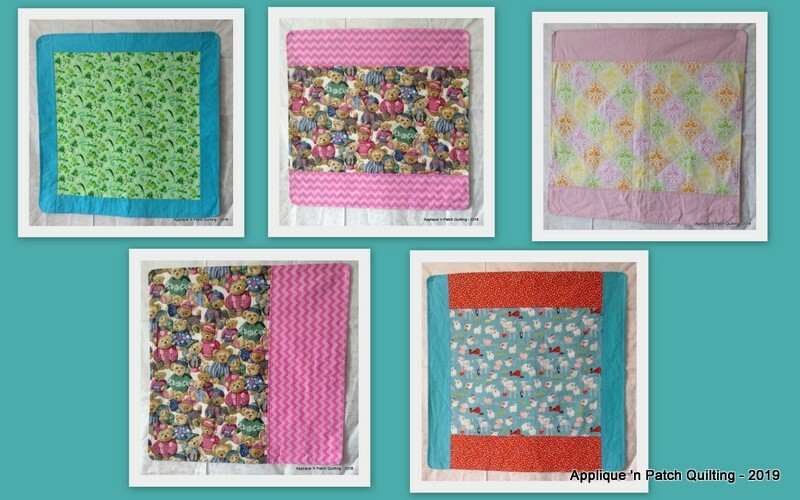 Hand quilting. I want to get it done. What else? This quilt. The binding is on and even the label, but I had asked LAer Tella not to do any custom quilting on the leaves and circles in the borders. 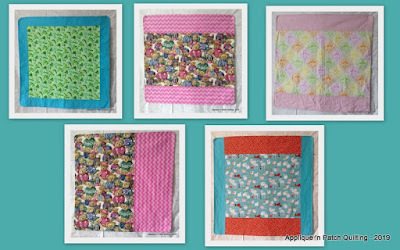 These are being hand quilted. There are a lot of flowers and each is taking time, but they will be worked on now and then and by spring I can show you this quilt as finished. That is my goal. I'm hand quilting around each leaf and circle and then putting an X right through each circle and a single line on each leaf. 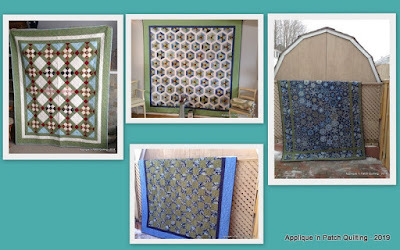 Love the look and so love this quilt. 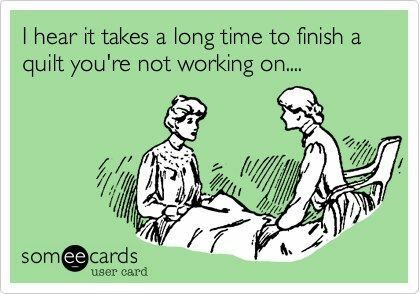 Gotta get it finished! Which ufo? This one from 2015. It is time. A HUGE WOW!! Congratulations on ALL you accomplished last year!!!! Looking forward to reading about all your progress this year. Happy stitching. What a great visual to be able to keep track of all that you have gong on. Seeing those big X's is good motivation, I can tell. 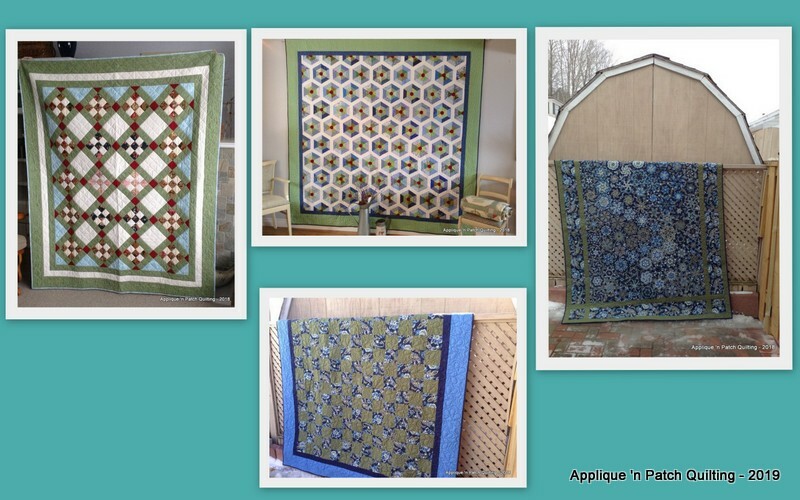 It feels good to have a fresh start each year, even if many projects keep showing up year after year. It means there's hope. clever way to organize and visualize the projects both completed - congrats - and on going. Your chevron LC is just lovely. That colors and rich and beautiful.